Hi, I am interested in your 1924 Ford Other Ford Models (stock #1686-TPA) listed on Autotrader for $23,995. I'd like to get more information about this vehicle and confirm its availability. This 1924 Ford T-bucket is for lovers of true old-school hot rodding. Because as you dive into the details, youll see a shining presentation that proves this is far more than just a lightweight street machine with a powerful V8 up front. This one knows how to make a proper first impression. The fiberglass body makes for a great place to lay down the smooth black paint. Even the top of the grille, headlight bezels, and rear carriage lights were painted to create a very uniform look. The black body also provides the ideal canvas for all that chrome-like pinstriping w/burgundy boarder. This unique stripping on the body coordinates nicely with a ton of brightwork. The polished drop axle front end, two-piece upright windshield, long side pipes, and beer keg gas tank all deliver that classic custom T-bucket look in a shining package. Even the wheels are terrific. Up front is the classic skinny tires on drag-style wheels. The rear has the width to show where the rubber meets the road, and the smoothie hubcaps even have their own mascot (see what we mean about the details!) And its all finished with classic whitewalls. Inside is a true classic T-bucket style with a nice texture on the seat and side panels. Even the steering wheel properly fits in-between your legs. And youll love the details, like how the dash has the exteriors cool pinstriping. Plus, it has the right performance machine feel with the B&M ratchet-style shifter and a full set of crisp VDO gauges. They spent time on this motor, and so it deserves to be on display for the world to see. Its a tidy setup with an aluminum radiator, upgraded pulleys, an etched air topper, and matching valve covers that also hint at the bow tie power in this Ford. And like any good hot rod, this V8 was built to run. The 350 cubic-inch motor has been enhanced with aluminum heads, a Holley four-barrel carburetor, and hi-rise aluminum intake. So this makes plenty of power to feed those growling side pipes. Plus, you have a four-link front end, hairpin rear, and a stout three-speed automatic transmission. 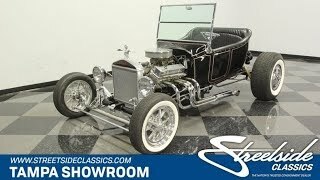 This T-bucket has a great presentation and the details youll love. So dont miss out on this total package icon. Call today!! !